grouser (Ludlow, United Kingdom) on 11 August 2010 in Landscape & Rural and Portfolio. Collecting Hay for Silage at Priors Halton, near Ludlow. I think the UFO in the near centre of the picture is probably a buzzard hoping the tractors willl disturb a meal for it. Great UFO shot..Oh, and the rest of the shot is cracking too! @Fonts: Sadly we don't get Vultures in the UK Adela. A buzzard is the most likely. Under your always personal skies, here is a superb touch of smiling colors ! A beautiful harvest scene in the country. Good composition with the touch of red of the tractor on the right. Fantastic composition, love the sky and the whole thing in fact! A fine harvesting capture with action and a well prepared field. The wind rows are very attractive. It's interesting that they grind right in the fields and blow it in a trailer behind the second tractor. Fine shot of the process. Glad to see somebody doing something to help combat the rising grain prices from Eastern Europe. Lovely vibrant fresh colours in this image Grouser. Beautiful light on the fields and machines..under a stunning sky again! gorgeous scene . beautifully taken . Reminds me of Corside Farm Angle,home brewed beer and ham sandwiches in the farmyard,...Oh to be young again. Those tractors - what a super composition. Wow, another gorgeous sky! 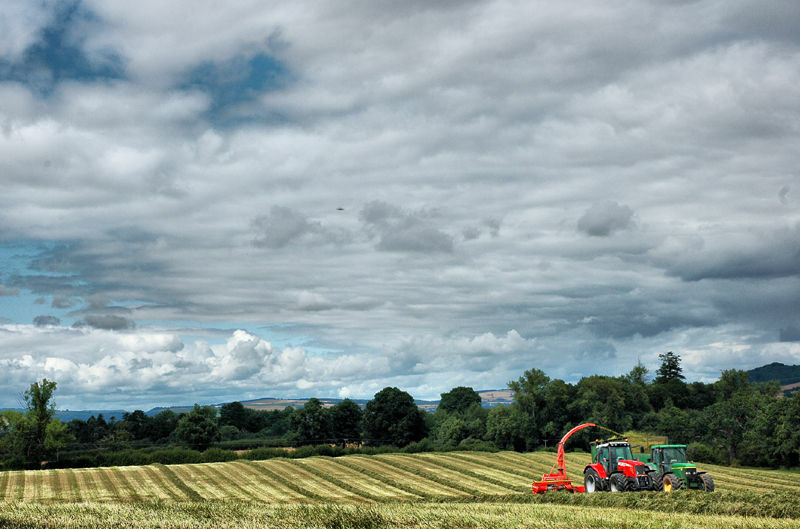 I love the bright colors of the tractors in these wonderful tones and colors of the field and surroundings. comme une carte postale ! belle atmosphère et très beau ciel.